The temperatures during Daddy's morning run were below zero, and the pond in the foreground had frozen over, covered with a layer of ice. 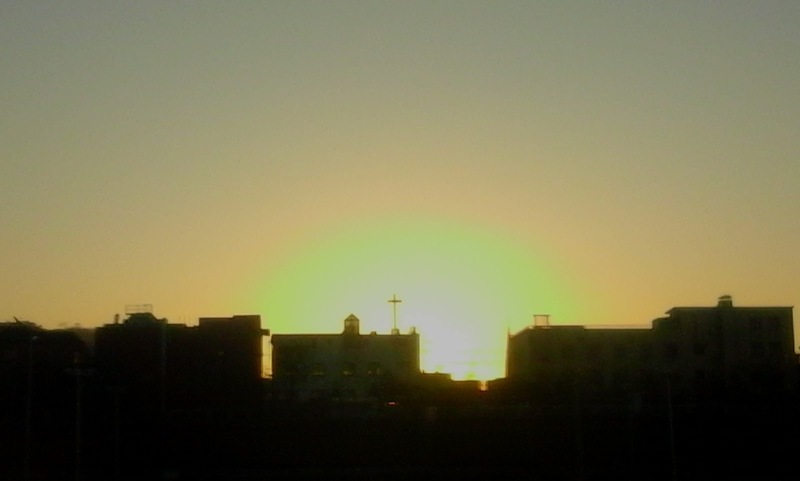 Beautiful breaking of dawn silhouetting a church crucifix. 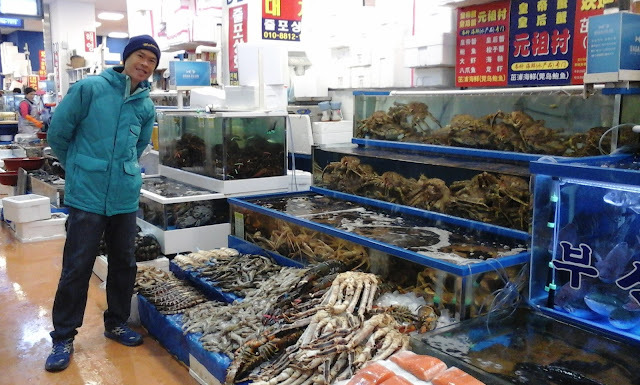 Since it was almost lunchtime, we decided to head down to Noryangjin Fish Market where Mummy was craving the Flower Crab Stew she missed during our last visit. It's a dish from the stall of a particular old lady she had became fond of. We took the subway to Noryangjin station and took the underpass to the market area, gawking at all the produce being sold along the walkway. 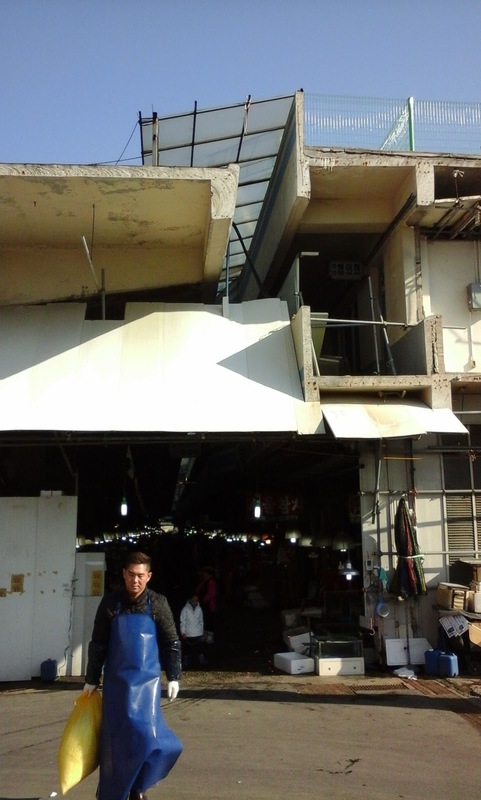 Unfortunately when we reached the market, we noticed that the entire upper level had been gutted. Next to the original building was a brand new building that appeared more modern and clean. 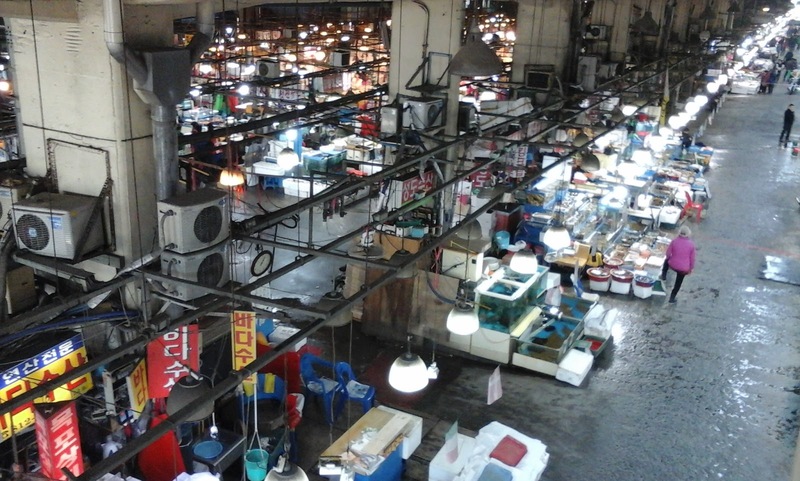 There were many vendors on the ground floor, with shops and restaurants on the upper floors. We were told that all the restaurants on from the original building had been moved here, but after asking around, we could not locate the old lady that sold the flower-crab stew Mummy had been looking forward to. 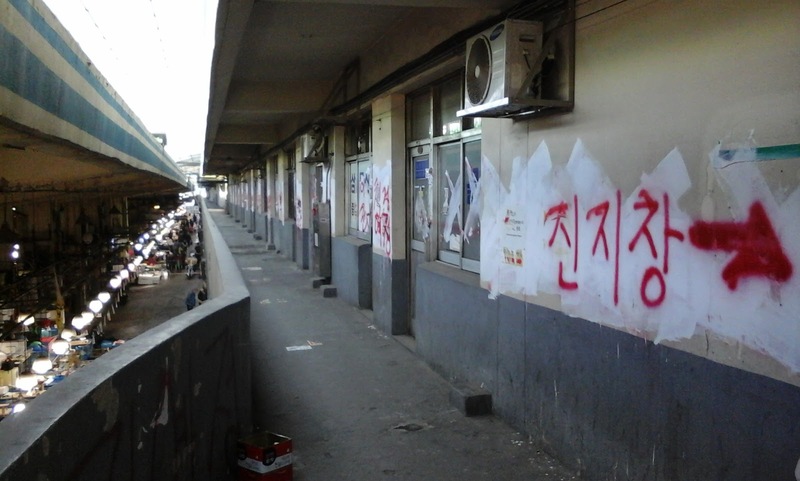 The upper floors were dismantled, but the wet market on the ground floor was still business as usual. What was left of the upper floors of the original building. The writing on the wall seems to tell us to turn back. 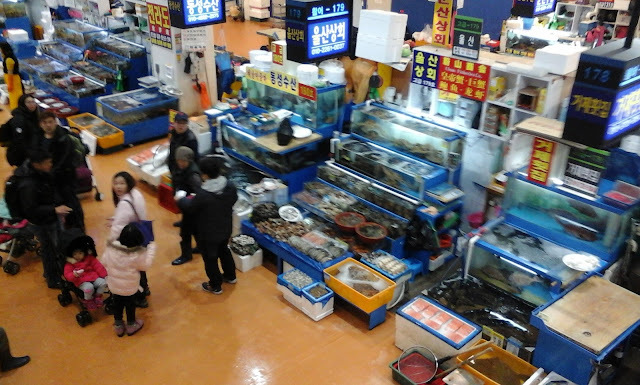 The new building had a ground floor with vendors selling fresh and live seafood, similar to what was sold in the original building wet-market area. Mummy had a discussion with the restaurant owners on the second floor. 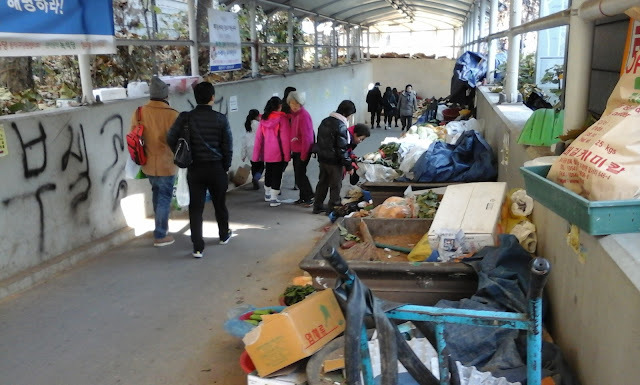 Many of them serve their own specialties, but if you wish to have something fresh from the market below you can buy it up and request for them to cook it. A shop selling processed seafood where Daddy picked up his lunch of sashimi to bring along to our next stop, Lotte Mart! Mummy approached a restaurant owner to inquire about flower crab stew but he was going to charge a high price for it (his restaurant did not sell it but he offered to buy the crab for us and cook it). Mummy decided it was not worth it. Since Mummy's craving was not to be found, we decided to head straight to Lotte Mart to do some goodie shopping and have lunch there. Friends had placed a list of orders with Mummy, and she thoroughly enjoys hunting for them. It seems to give her a deep sense of satisfaction to bring back bags of treasures for all her friends. 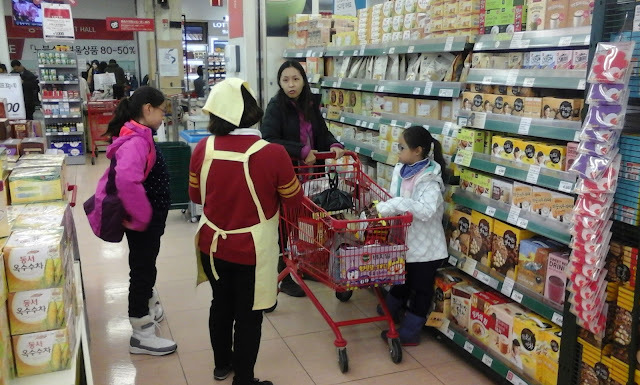 It helps that she has been here a few times, and has a keen eye for bargains and lowest prices. 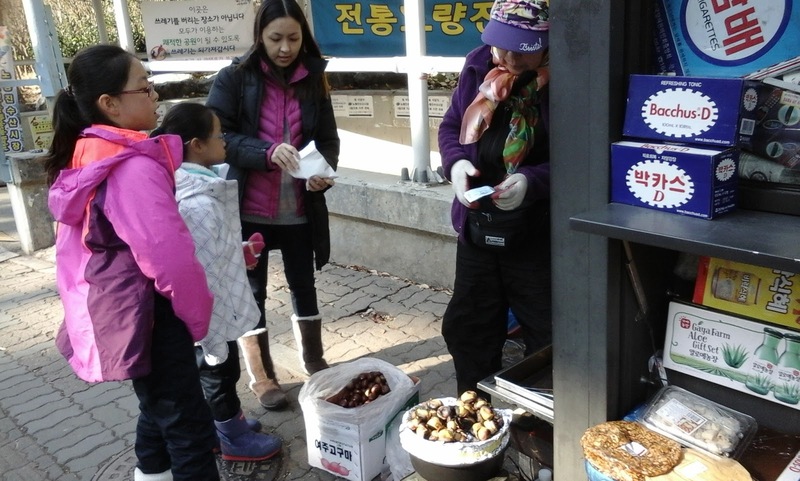 On the way to Seoul station, we stopped outside the underpass to pick up some roasted chestnuts, which tasted wonderful on a cold day. 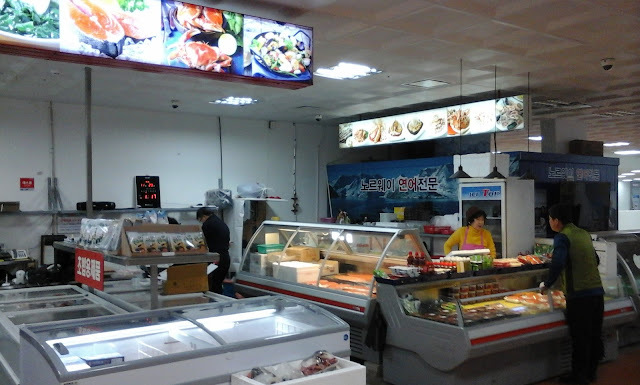 At Lotte Mart, lunch can come in the form of pre-packed foods bought off the shelf or cooked food from the stalls there. We sat down at the eating area within the supermarket area (there is a food court on the second floor) and and a hearty meal before going on our treasure hunt. 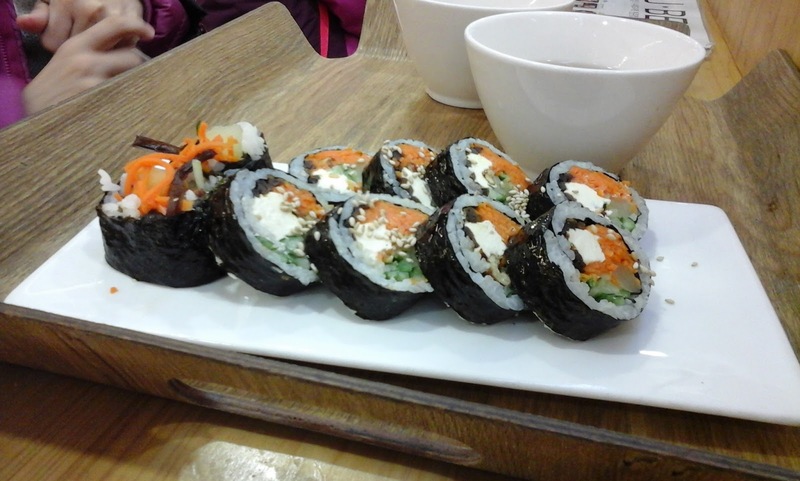 Kimbap with cream cheese and vegetables bought off the shelf. 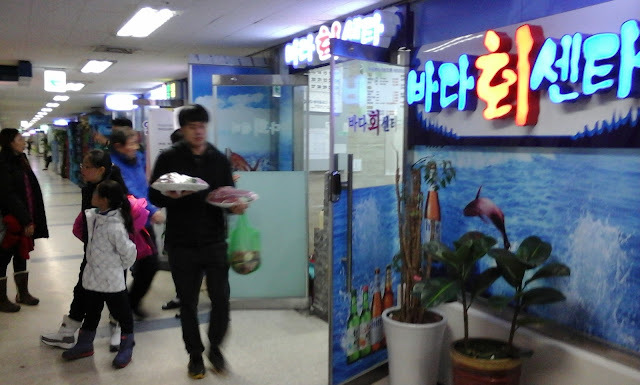 Sashimi-to-go from Noryangjin Fish Market. 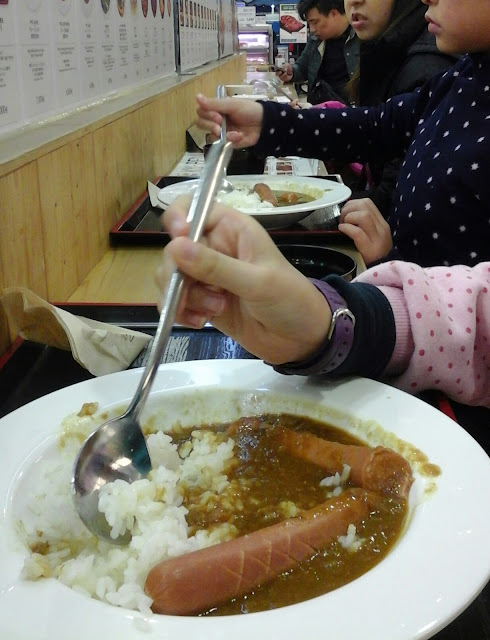 Kids ordered rice with sauce and sausages from one of the stalls. We expected to bring back a lot more loot but after comparing prices with online sellers such as those from G-Market, we found the online sources to be cheaper for a number of items. We decided to have those items delivered to our apartment instead of picking them up from the shopping centre. 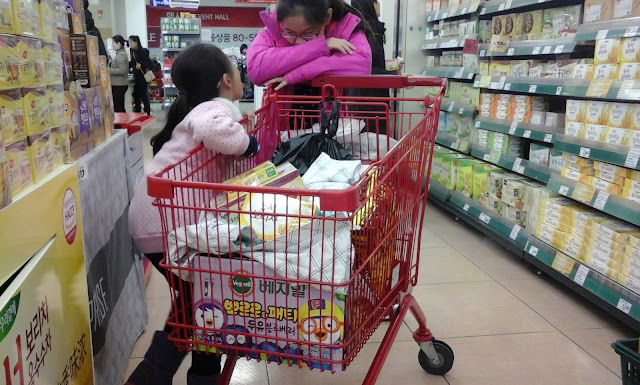 We still had a cart-full, with some goodies for ourselves. 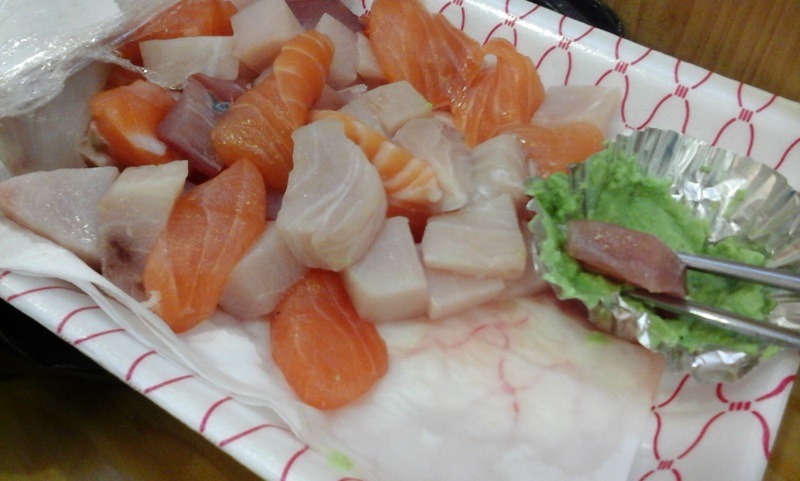 We headed back early and decided to buy in some dinner before an early night. The night was spent unpacking and lazing around, activity books we brought from home to finish up, and watching videos. It was the holidays, and it was starting to feel even more like it with a 'free and easy' holiday. 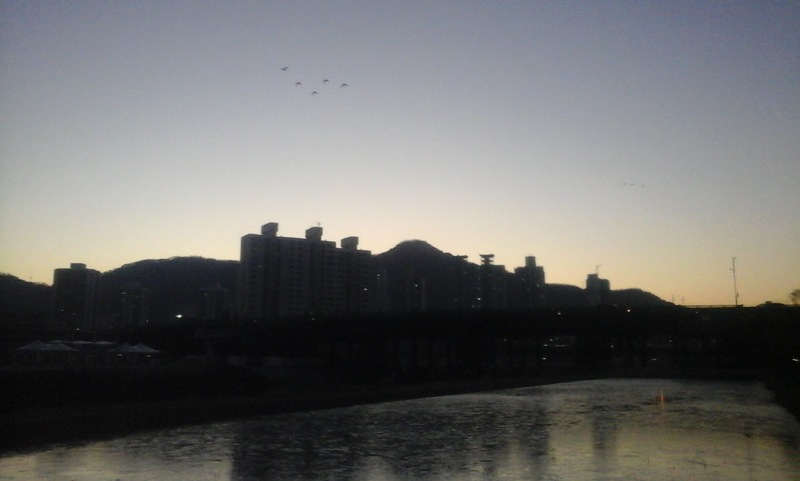 Maybe another sleep-in tomorrow?